So how long has this been on the market? The price seems low, even for Flint. Is the foundation messed up or something? The price is about right for that neighborhood, it has been declining rapidly for the past 3 years. So what would that house go for in a good San Francisco neighborhood, with the same amount of property? It's hard to track down a place with a yard like that in SF, but here's a fairly comparable place in the city — a lot nicer interior but one fewer bath — in the North Beach neighborhood for $3.6 million. I'd imagine the Flint house is the same location would be about the same price. The 2009 StreetView images include a dog behind the driveway gate, but the interior photos... particularly the kitchen, but the bedrooms as well... look "dressed", as if the house was unoccupied and empty and a decorator was hired to bring in furniture and furnishings for photo purposes. Having table service for 16 stacked on the kitchen counters but nothing in the glass front cabinets is strange. Empty houses often have soft pricing, especially if the neighborhood has an excess of houses for sale. StreetView seems to show a For Sale sign on the much-more-ordinary frame house across the street, but no others in the block... at least when Google drove through. But, empty nice houses often don't get signs because it makes them targets for break-ins. My wild guess would be that this particular house might be susceptible to an aggressive offer. Architecturally it's a really nice block. That house was built by Preston Champion. He was Albert Champions 1st cousin. The tile is gorgeous. The lot is small though.. and the ceilings in the basement are low. Besides that, it is a gem. I nearly bought it in about 2004.. at the time the asking was $179K. Thank god I did'nt. I grew up on Maxine, 1/2 block south of E. Court. I'm really trying to remember who lived there in the late sixties... can't. I've been to Flint recently. The city has assumed the nature of a 'small town'. Crime had actually diminished. Reason for the low price: police and fire services have almost vanished. A friend tells me a house caught fire in the old east side neighborhood (near Central High), and it took the fire department close to half an hour to get there. It burned up. But anyone willing to ride out the restructuring of Flint (shrinking it down so services can be scaled for a much smaller city), this house will prove to be a bargain, along with many others in that neighborhood. 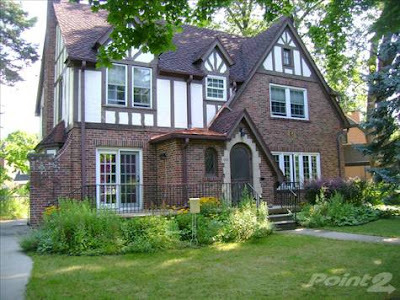 It's across from a park, it's within walking distance of the old U of M campus. It won't go too much lower than this price. The house has been for sale for a while - I don't recall when I first noticed it, but it has probably been more than 6-8 months. I have a soft-spot for this "vintage" of Flint home, - something that doesn't really exist to the same extend in Grand Rapids. Therefore, I tend to watch a few at a time. My mother lives a few blocks away, on Court Street - and is quite happy with her neighborhood. This house, being blocks closer to the "estate" style homes, in my opinion, doesn't put it in a "declining" neighborhood - at in terms of removing the argument of "declining services" in Flint as a whole. However, that being said, my father lives in a MUCH more depressed neighborhood - and when his garage had a fire, the department was there within minutes. Blanket statements about the services are precarious things to say. We discovered, while buying our 1970's ranch, which was empty at the time, there is a whole different set of issues when buying an unoccupied house, especially with respect to inspections, etc - chances are - this house has not sold for many of those same reasons, as well as - why buy this one, with a small lot, if you can get something comparable with much more? There are so many gems to be found in Flint! Seeing this, the photos and the comments, makes me feel sick. I live just a couple of blocks from this house and my husband and I also considered buying it at $225,000 seven years ago when we bought our current place. I too love this neighborhood...I didn't grow up in Flint but now I'm in the place with both feet, and it just makes me feel light-headed and depressed to think that all these years in a place might simply lead to nothing. Or that people think it's going down. I've felt lately that perhaps there are signs of hope, but for some reason, seeing the price on this lovely place just makes me feel shaky and sad. Regarding the Woodside house having reached its bottom...per Zillow, recent transactions in the neighborhood to the west and south have been as low as $9900, and the neighborhood to the east and south mostly in the $30Ks. Often, low cost housing is correlated with social ills. It can be rough living in an area of fancy houses that's readily reachable at night by folks that have a drug habit to support. What's the far end of the time window on Zillow for showing "recent sales"? The Woodside-Woodlawn area has a tremendous number of "recent sales" and listed houses compared to most neighborhoods in the burbs. Have all those sales been within a year? How about the near end of the time window--how soon do they include data for sales after closing? I looked at another location where a known closing date was about two months ago, and they don't have it...yet, anyway. I've noticed a couple times on San Francisco sales that Zillow can take several months to post recent sales. And the Flint property tax website used to post recent sale info on numerous properties, but the don't seem to carry that info anymore. Macy, I understand the feeling. It's hard to see a house that beautiful in that neighborhood sitting on the market at that price. I am pretty sure that's the house Peyton Manley lived in while attending Whitter and Central from 80-87. Cool house. Is it located on Maxine St.? I too live in the College/Cultural neighborhood. I will say that yes, many homes are going for bargain basement prices right now, but not due to crime or declining city services. 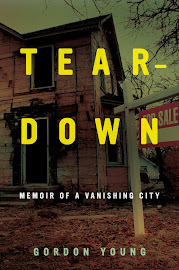 Many of the foreclosed homes had families in them that lost jobs in the area and had to re-locate out of state for work. Many, if not all tried to sell, and some gave up and let the homes go to foreclosure. I have met three young couples who got into homes on my street, Kensington, for under $50,000. They are employed, enjoy living in their hometown and are trhilled to have been able to start their families in a great neighborhood. Current homeowners may never again see the high prices some of us paid to get into this high-demand area, but I'm hopeful our investment will pay off in the wonderful neighbors we have and the atmosphere we all create together. Let me tell you about this house. It was built by PROSPER Champion, the brother Albert Champion (father of both AC SPark Plug and Champion Spark Plug). Prosper Adored his brother Albert. Albert dies at the peak of his game in Paris under mysterious circumstances. Something about a love triangle. Prosper did get revenge for his brothers death. Prosper and Albert both are French. I am now I Flint expatriot living in the small country of Luxembourg. They have a memorial here to Albert for a race he won here. Albert Champion duked it out with Louis Chevrolet. Prospers wife died on the doorsteps of the above home when whe heard her son had been killed in WWII in Italy as an aviator (for the Americans). I am sure the place is friggin haunted. Propser tried to launch his own company using the Champion name. That was a Bozo no-no. Ironiacally, his brother ALBERT tried to do the same thing, but sold the rights to the Champion name with the original Champion company on the east coast. Hence AC Spark Plug. Prosper tried to call his plugs Prosper Champion - did not fly with the law. You are correct. I am Robert Champion, son of Paul H. Champion and grandson of Prosper Champion. My mother and father lived in that house for a while after they were married. My guess would be that the northernmost home on the park side of Woodlawn might have been built for someone of significance in Flint area history. Anyone know who that might have been? Once again, Flint is not the only place this is happening. It's happening statewide, and not just in central cities. This kind of thing is also happening in such "growth areas" as Las Vegas. The same people whistling past the cemetery just a few years ago about how great a city built on gambling debt is somehow better than a "Rust Belt" city whose economy depended on manufacturing. Folks, it's no longer just Flint with these problems.